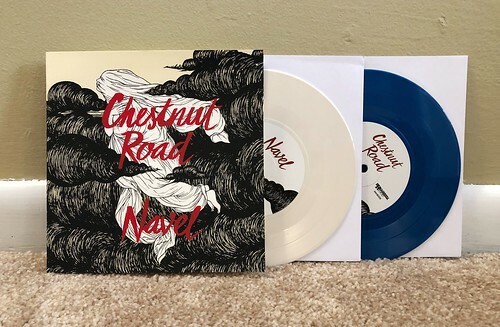 This split marks the first appearance of Chestnut Road in quite some time. They contribute two melodic punk stunners that would have been right at home on their last full length that I liked so much I put out on PopKid records. "Black Corridor" is the slower of the two, but it still invokes the sort of 90s UK magic that makes that one of my favorite times in music. It's similar to some of the slower moments of Broccoli. The second song, "Prison," is just incredible. This one is faster and makes me think of the best kind of Hooton 3 Car songs with rapid chord changes and supremely catchy hooks. I've said dozens of times that Chestnut Road is one of the best bands on the planet right now, these two songs further cement that claim. On the other side of the 7" we have Navel, an incredible Japanese band that I've been listening to for over twenty years at this point. It kind of amazes me that they somehow seem to get better every time that I hear them. The two songs on this 7" are two of the their best yet. "Dying" is just an incredible song, blending complex and melodic guitar parts with Tomi's trademark higher pitched, but ultra catchy vocals. "End of the Line" is just as amazing, with a slower driving beat, but still maintaining the sort of catchiness that has always made me love this band. Both songs are slower than the sort of rocket fast songs that made up their classic album Uneasy, but as much as I love that album, I'd have to say that these two are even better. This is quite simply an amazing 7". I certainly shouldn't have to convince you to buy it. If you read my nonsense on this website, odds are you are probably inclined to like this sort of thing. So I'm not sure what you're waiting for. Go get it. Chestnut Road / Navel - Split 7"
Frankie Stubbs - Heart Is Home 7"